Fast forward 12 years, and Hamas's de facto state is facing economic collapse, a break-down of its infrastructure, regional isolation, and a population that is increasingly fearless about expressing its anger at Hamas over the hopeless situation it is in. In its 12 years as the sovereign regime of Gaza, Hamas has tried to dance at two weddings, staying true to its terrorist DNA on the one hand, while trying to act like a legitimate government on the other, in charge of law and order and basic services. This 'identity crisis' has helped drive Gaza to the edge of an abyss, and Hamas is now desperately looking for something, or someone, to provide relief. Hamas prioritized its military wing above all else, and Gaza's civilians have been left with very little. Today, Hamas is isolated, facing pressure from Egypt, the Palestinian Authority, and Israel, and the more that it feels like it is in the corner, the more it is prepared to take risky steps to try and find a way out of its distress. During the past year, Hamas felt that Gaza's economic situation was increasingly approaching implosion. 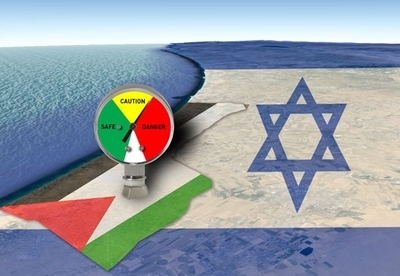 To avoid this crisis point, Hamas employed a policy of 'controlled escalation' to pressure Israel, Egypt, and the international community to find a solution – namely, international donors and an opening of border crossings, as well as the establishment of a seaport. Hamas refuses to stop mass producing rockets and pointing them at Israeli cities, and refuses to stop trying to orchestrate mass casualty terror cells in the West Bank. At the same time, it demands free access to the outside world, and claims security restrictions against it are part of an 'unjust siege' that must be lifted. While there is some speculation over what exactly caused this latest round of fighting, it is beyond doubt that Hamas is feeling the heat from new protests by Palestinians trapped under its rule. This is pressure could turn into new fuel for Hamas's extortion campaign. The more internal pressure Hamas feels, the more likely it is to try and divert that pressure outwards, primarily at Israel, and also at its internal arch rival, the Palestinian Authority. The long-range rocket that destroyed an Israeli home north of Tel Aviv in recent days, setting off the latest flare-up, was produced in a Hamas weapons factory, and fired from a Hamas position, according to the IDF. The rocket itself is a timely reminder of the resources and effort Hamas pours into creating a mass rocket base in Gaza. Together with Iranian proxy Palestinian Islamic Jihad, Gaza's combined arsenal stands at an estimated 20,000 rockets. Things could come to a head Saturday, when Hamas plans mass marches and potential border violence to mark Palestinian "land day." Similar Hamas-organized disturbances during the past year have included grenade attacks, bomb attacks, and attempted border intrusions. Hamas operatives have frequently used human shields to threaten the Israeli border and nearby communities. This has forced the IDF to take action to defend the Israeli border. If similar scenes occur on Saturday, and Gazan rioters sustain casualties, Gaza's terrorist factions could respond by renewing rocket fire on Israeli civilians. This time, however, a new escalation could result in an Israeli ground offensive. The IDF completed preparations Thursday for the possibility of new Gazan attacks, by mobilizing large numbers of ground forces to the border with "Hamastan." Infantry brigades, artillery, and armored units are all parked on the Gaza border, and leave has been canceled for all combat units in the IDF Southern Command. Israel's message seems clear: If Hamas starts firing on Israeli cities again, it will risk an Israeli ground invasion. IDF retaliatory strikes targeted key Hamas buildings. This message comes after Israel seems to have gained all the mileage it could from air strikes on terror targets in Gaza. In recent days, during the escalation that began with a Hamas rocket strike on an Israeli home injuring several of its inhabitants, the Israel Air Force has fired on multi-story buildings that have served Hamas's military wing. 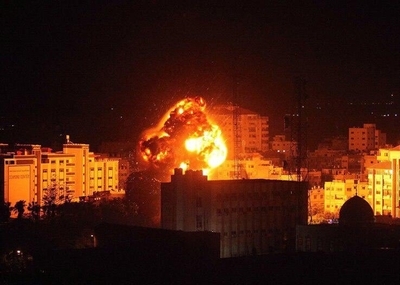 The targets included the offices of Hamas chairman Ismael Haniyeh in Gaza City's Rimal neighborhood, the Hamas Internal Security building in northern Gaza, which conducted hostile military activities, and a secret Hamas military intelligence building in central Gaza. These are high value Hamas assets, but the air force did not bomb Hamas's senior commanders themselves, who were likely using Gaza's civilians as human shields, hiding in crowded multi-story buildings, or in bunkers underneath them. As a result, Israel is threatening ground forces action if Hamas escalates again. The coming days and weeks will reveal whether Israel's new posture can cause Hamas to scale back its extortion campaign, before the situation deteriorates into a new conflict.